A few days ago I shared chocolate mousse Quinoa style recipe and I told you that I'd been really busy with my allotment. That is an understatement! To remind you what it was like when I first took it on here are a few photographs. 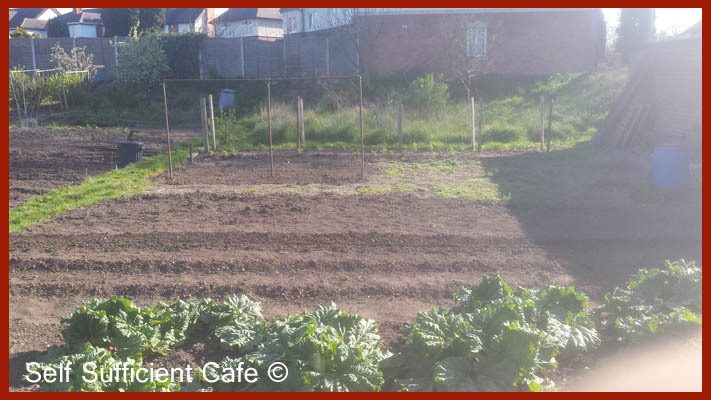 I was a proud owner of a massive plot which needed a hell of a lot of work, but I didn't let this worry me. Spending time down here is fabulous, and as an added bonus Marco loves it too. At first I must admit some days I did get a bit disheartened as I'd spend hours with not really much to show for it. But I needn't have worried my hours of work has paid back a plenty. 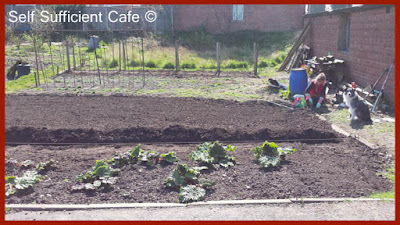 The first thing I needed to do was to weed the front part of the plot, the weeds were growing faster than I could weed! Thankfully I had a little help from my Mum and sister and it wasn't long before I started planting. Thanks guys! The plot is seriously huge and is in two distinctive parts; the front part which had been cultivated previously and the back part which was a jungle but did 'house' two apple trees, an eater and a cooker. 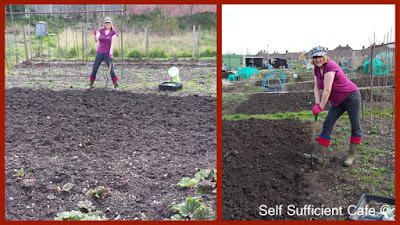 After digging over half of the front part of the allotment I was ready to plant. The first thing to go in? Two rows of potatoes, Charlotte potatoes to be exact. Boy are they tasty too! In the front of the above photograph you can see the rhubarb starting to grow, and my chest freezer is full of rhubarb crumbles, 12 to be precise! Plus bags of frozen rhubarb just in case I run out! 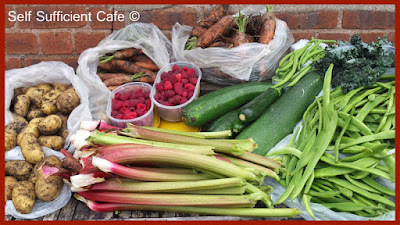 The rhubarb is coming to an end now but its still growing the odd few tasty stalks for me to pick. I'll post my rhubarb crumble recipe very soon. Once the potatoes were in it was time to plant two rows of onions and a row of shallots. The onions are doing great and I pulled a few on Saturday to leave out to dry but unfortunately the Great British weather has let me down! It has done nothing but throw it down with rain since! That'll teach me to believe the weather forecast! 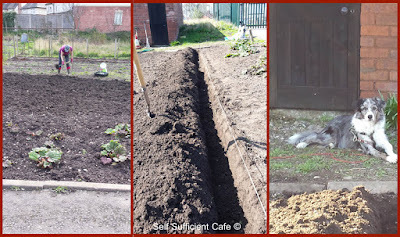 The next job was to dig out a bean trench and fill it with grass cuttings and vegetable peelings to help retain water (runner beans are thirsty plants) and provide some nutrients to the soil. 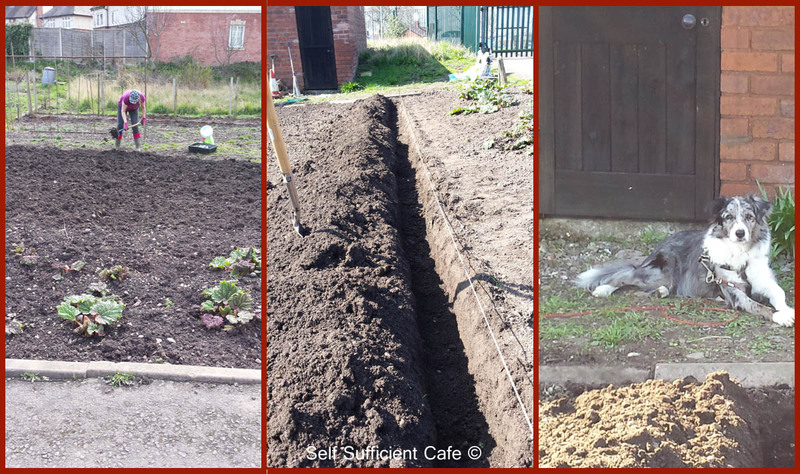 Once the trench had been filled we watered it and shovelled back the soil. Next job was to erect the climbing frame for the runnerbeans. Yes its a play ground for vegetables! The plot had a lot of 'rubbish' on it which we put to good use. The goal post frame and middle post are similar to that of old washing line posts. There are still a couple more to be used on the plot which I'm sure I'll find a use for. Next we tied two canes either side to form an upside down V shape and secured them with twine at the top. 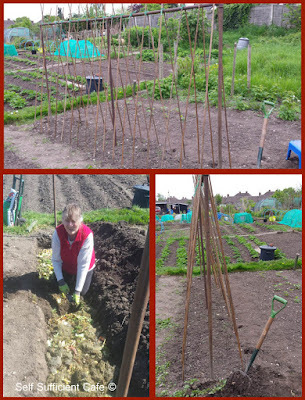 We spaced them out so we could plant a runner bean plant or sow a seed to each post. As it turned out we sowed two seeds per cane or planted two runner bean plants to a cane. It hasn't done the plants any harm. 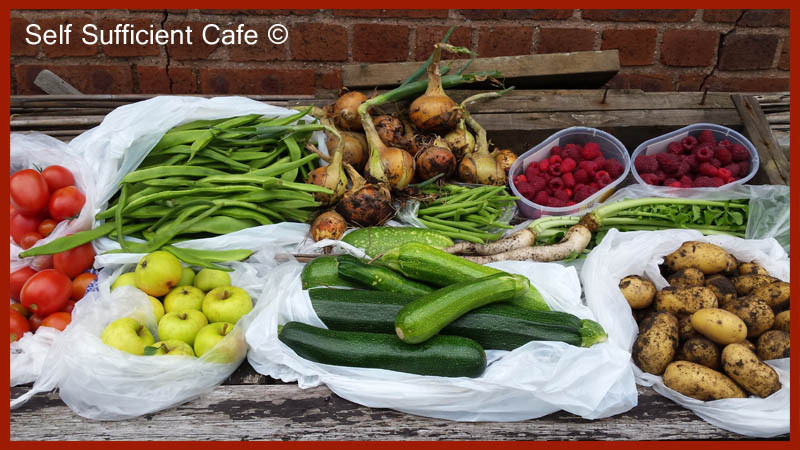 In fact my first harvest from the plants weighed 1 stone in weight! I was warned that the plot suffered with both carrot root fly and onion fly and that last year a lot of people lost their crops to both pests. Not to be put off I still sowed two rows of carrots, an old English heritage variety which is purple in colour and a second row in a more traditional variety. 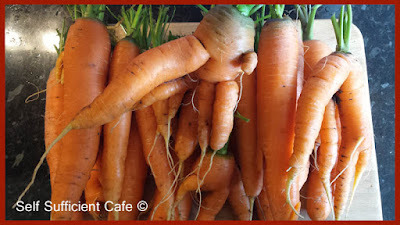 Unfortunately the purple variety never germinated but the more traditional variety produced some huge carrots, even if some of them were weird and wonderful shapes. I'm certainly not a grower of beautiful vegetables. I covered both rows in a fleece to protect from the carrot root fly, but to be honest it didn't last long with the bad weather we had and after a couple of weeks it was full of rips and gaping holes. However I never took it off until the carrots had pushed it to its limits. Boy oh boy when I did I was so disappointed the rows were covered with weed! And the weed was bigger than the carrots. After hours of careful weeding, trying not to disturb the carrots so they release their scent to the carrot root fly the job was done. However if I could smell the carrots then that little pest would be able to! 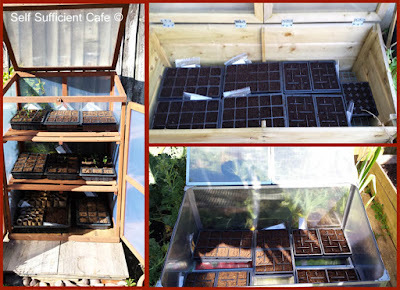 Back home I was busy sowing seed, broad beans, runner beans, cauliflower, purple sprouting broccoli, kale, Brussels sprouts, French beans, courgettes and winter squash. After a few weeks the broad beans were ready to be transplanted and I had more than a few! It turned out that the shop had sold me two varieties of broad beans instead of a pack of broad beans and a pack of runner beans! 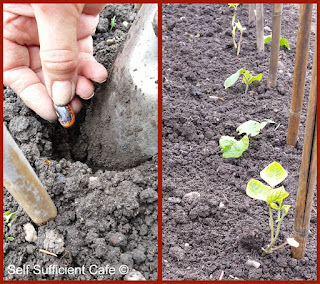 Even when I was sowing the seeds I did think the runner beans looked strange more like a broad bean but I thought the shop knows best and they did say they were a new variety of runner bean they were trying out so I ploughed on. You can see in the photo above that the potatoes had started to grow, so too had the onions and shallots. 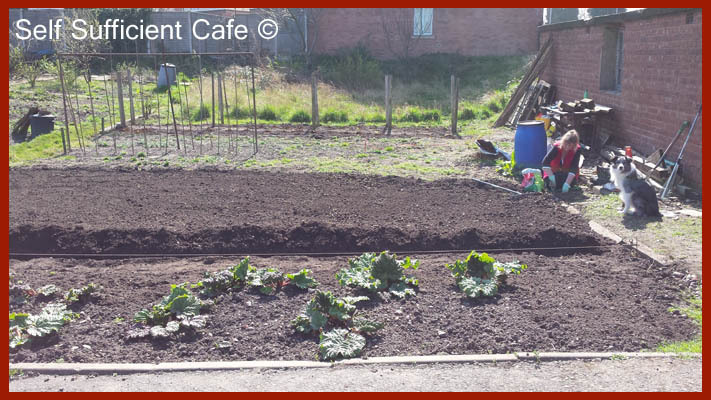 Behind them are the fleeced carrots and behind that on the left is the broad bean patch and then the runner bean patch. That's me! Sticking my thumb up ha ha ha. You can see that the back part of the plot is a jungle, it might look very lush and green but don't let your eyes fool you its a mass of brambles, old raspberry plants, red currents and black currents and thickets of stubborn grass! The earth itself is in no way flat either its full of mounds of earth, you have to be careful not to twist your ankle when you walk over it! Back to the front part of the plot, the part I could manage. The next job was to sow the runner bean seeds as I hadn't got any plants to transplant! 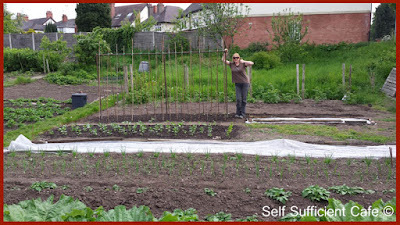 Lucky for me the other plot owners are a generous lot and T gave me a few runner bean plants too. There was a sense of urgency now as time was ticking into the growing season and I had so many things left to do. 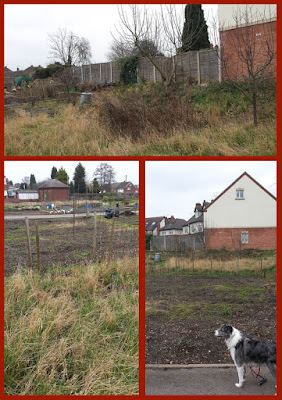 Let alone dig over the remaining front part of the allotment. I ended up buying some strawberry plants which I planted. I haven't had any strawberries this year but I've pinned down a few runners and hopefully next season I will be blessed with lots of juicy ripe strawberries. I was also given quite a few sweetcorn plants too from another plot holder so they went in behind the runner beans. 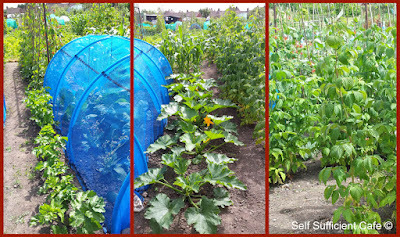 Next I needed to erect some tunnels which were covered with fine mesh for my brassica plants so they wouldn't be harmed by the white cabbage butterfly and other pest that love to devour a whole row of brassicas. Thanks again to T who showed me how it was done using plastic water hosing and the fine net you can buy in the shop. Two tunnels were made and one 'housed' my purple sprouting broccoli plants and the other a selection of other brassicas including, cauliflower, Brussels sprouts and kale. 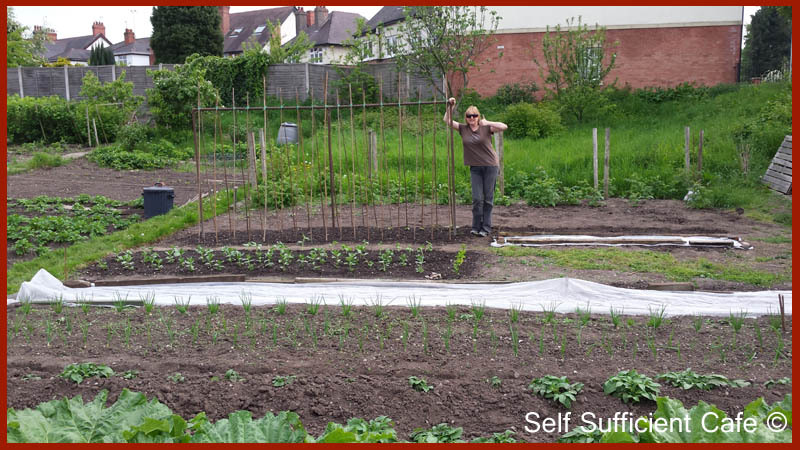 Once the two tunnels had been erected it was a case of finding a space for all the other plants I had grown from seed, including parsnips and celeriac. The courgettes just slotted in nicely next to one of the mesh tunnels and the parsnips the other side. The celeriac kept my broad beans company and the winter squashes found a home in the middle of the runner bean plants and to the side of the carrots and onions which for some reason I had missed digging over. 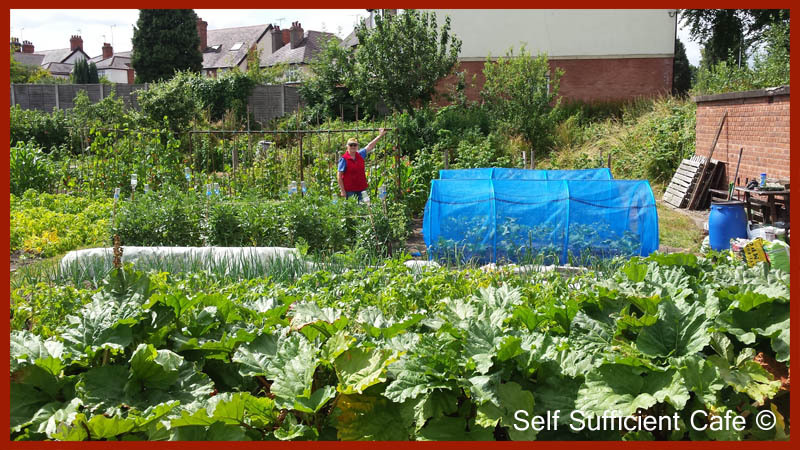 That's my gorgeous and lovely Mum in the photo above, she has been a fantastic supporter and we've had some fantastic fun down on the allotment! Thank you Mum for all your help! Just to give you an insight into my harvested produce here is a few photographs to whet your appetite and get you interested in growing your own. Some days I could quite easily open up a shop with the amount I harvest, thankfully I have a large chest freezer now which isn't far off bursting at the seams! There is still plenty to harvest too, I've only dug up half a row of potatoes, but I've chopped the tops of the remainder in case there is a blight attack. They won't grow any more but they will store quite well until about the end of October so I'm told. 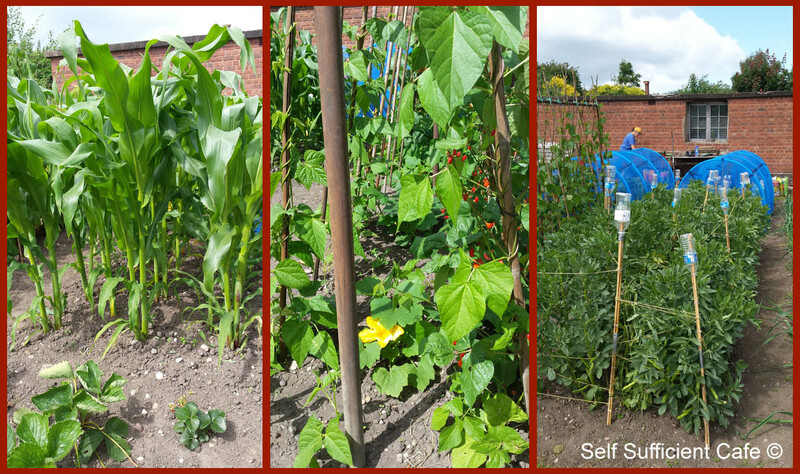 There are still plenty of bright red flowers on the runner beans and the courgettes seem to be multiplying by the second! There are lots and lots of winter squashes growing too so that should be another great harvest. 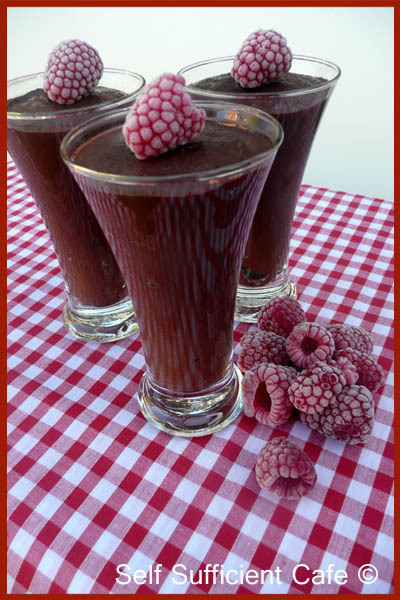 My Autumn raspberries grow enormous fruit and I've never tasted a raspberry like it, so my daily smoothie is a taste of heaven. I can't wait until both apple trees are ready to be picked my freezer will be full of apple pies and my dehyrator will have to come out to make some apple crisps. Gardening is great fun and the fruit and vegetables that you grow will taste better than any shop bought produce. 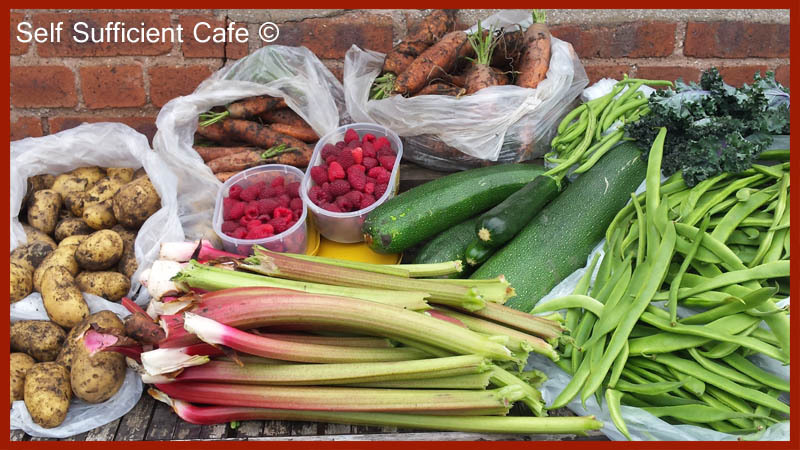 So what are you waiting for, get on out there and grow your own fruit and veg, it is well worth the effort! I hadn't been to Liverpool in over 20 years! I know I can hardly believe it myself. So when my friend and I were enjoying a meal out in Pizza Express a few weeks ago and Liverpool was suggested as a day out what else could I say but yes! After researching vegan eateries and places to see I was amazed at how much Liverpool had to offer. 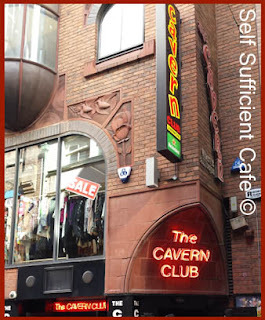 My friend, H, a trusty Liverpool guide helped me choose what to see. 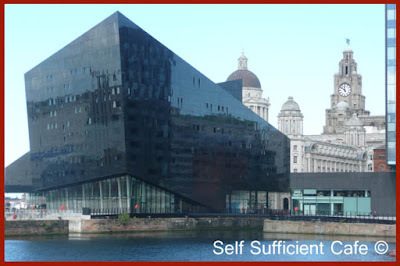 I wanted an over view of all Liverpool was and still is, a bit of culture and of course some delicious vegan food. 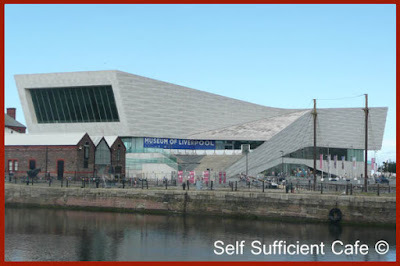 H suggested we start with the Museum of Liverpool, which was full of everything Liverpudlian! We headed straight to the second floor and had a mooch around the "Wonderous Place" exhibition. As you probably already know Liverpool has 'made' some very talented people; writers such as Jimmy McGovern who created the TV series "Cracker" and of course Phil Redmond who created Grange Hill, Brookside and Hollyoaks! Then there are the musicians and there are way too many to mention, everyone will know one of them for sure! Liverpool comedians are plentiful too and of course the sports personalities! There was plenty to see and do including a karaoke booth for you to use, and before you ask no I didn't! I was tempted but as I am completely tone deaf I though better of it! On the other side of the museum on the 2nd floor was 'The People's Republic Gallery' which is all about the experience of living in the city. A fascinating exhibition that deserved more time than we gave it, but we had so much else to see and do! Everywhere you looked old and new buildings stood next to each other and some of the architecture was fascinating, even if it wasn't my cup of tea. 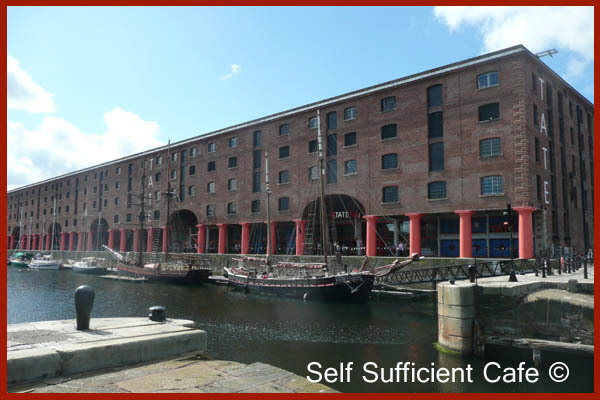 There is so many places to see in and around the Albert docks you could spend a whole weekend here, I never got to visit the Tate Gallery but that's on my list for next time. After a whistle stop tour of floor 2 of the Liverpool museum, I was ravenous and lets be honest my thoughts aren't ever too far away from food. Thankfully there were lots of options for vegans but there was only one place that we were heading to - Wagamamas. I found out that Wagamams caters for vegan after a trip to Birmingham and it was absolutely delicious so everywhere I go I always find out if there is one near by. I was that hungry and focused on food that I suddenly remembered that I hadn't taken a photograph of our starter to share. 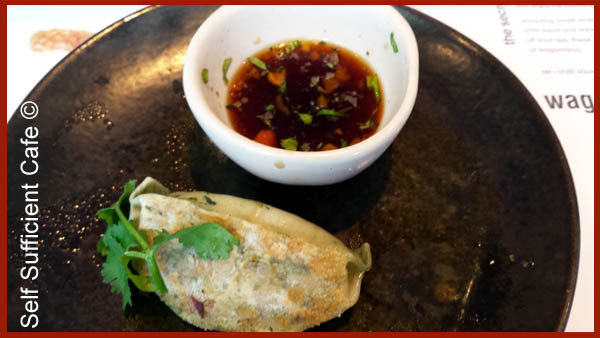 There was just one yasai steamed gyoza (vegetable dumpling) left so I took a quick snap before diving in. For my main dish I chose the yasai itame, a delicious dish of rice noodles in a spicy green, coconut and lemongrass soup, topped with vegetables and tofu. We also shared a side order of wok greens and the garlic in this dish is heavenly. Once again though my stomach overruled and I forgot to take a photograph. Bellys full we were off on an adventure, during my online research I had come across a vegan supermarket just outside Liverpool which was a 20 minute bus ride. There was no way I wasn't going to visit. Thankfully H obliged my wish to visit and after catching a bus and following our whereabouts on google maps on my phone so we knew where to get off we arrived! I loved this place! 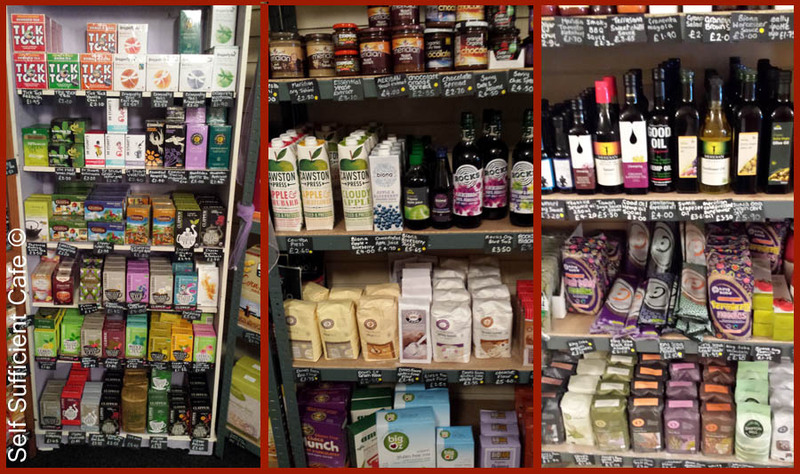 It was a vegan heaven, the photographs do not do it justice! When you first walk in to the Purple Carrot you are greeted with a beautiful confectionery stand full of vegan goodies, I couldn't resist I bought 3 Vego bars, one for H for putting up with my vegan adventures, 1 for my gardening angel and of course 1 for me. I also bought a slab of white chocolate and 3 packets of Ten Acre Crisps, the story of when cheese met the onion. The best crisps ever! I wished I had bought more now! The shop also sold a wide range of other groceries and I loved the little tea section in the corner, Caroline from Tea and Sympatico would love this! 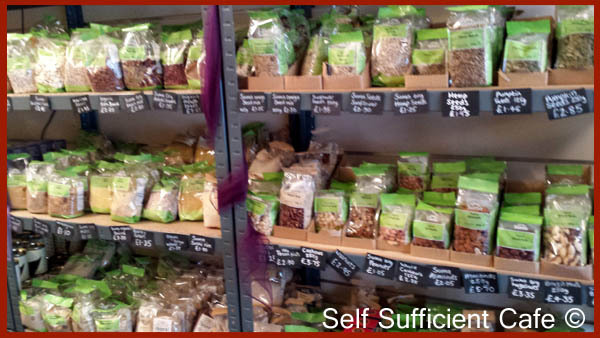 It was also great to see that the shop was packed with Suma Wholefoods goods too and everything was reasonably priced. If you live near Liverpool you really should pop in and see what it has to offer. 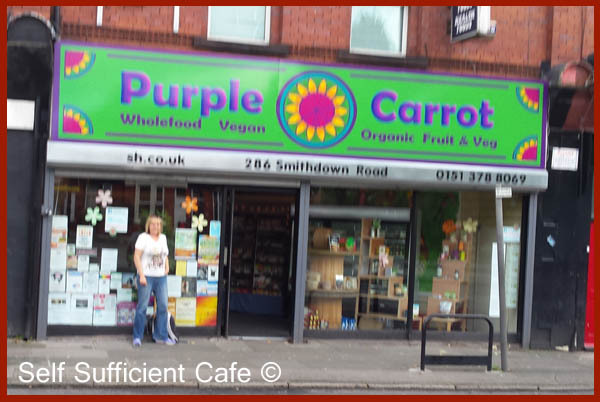 If you don't live near then a day out to Liverpool is in order and you can easily squeeze a quick visit to the Purple Carrot into your day. Next to the confectionery stand was the fridges and I nearly screamed with excitement at the vegan cheese range they had and I treated myself to a large pack of violife melty pizza cheese, violife cheese slices and two packs of no moo melty cheese! My fascination with vegan cheese goes on, hopefully my purchases will keep me occupied in the kitchen cooking up a vegan cheese storm. 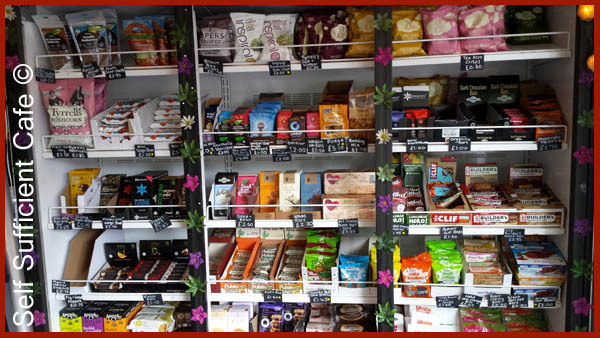 No visit to a vegan supermarket can go without purchasing my beloved nooch too, so two tins were purchased and I left a very happy bunny. After a bus ride back into the city we walked towards the Beatles old hunting grounds, I'm not quite sure what I expected but it wasn't what I found. We didn't go into the cavern but we did venture into the pub across the road, and turned round and walked back out, we tried. It was ram packed with people and was very hot, very hot indeed! It was a sweat fest ha ha ha! We had a quick mooch around the area and decided to move on. We needed peace and quiet after walking into the noisy and hot sweat fest, so we decided to make our way to the Walker Art Gallery and made our way to the beautiful Pre-Raphaelite paintings. I love this era and I am fascinated with the work of Dante Gabriel Rossetti. Time went by so fast and it wasn't long before we were told only 10 minutes before closing. After leaving the Walker Art Gallery we headed back to the station for our journey home after stopping off for a well deserved drink. All in all a fabulous day out and one which I will look forward to repeating again soon. Hi there! Long time no post! 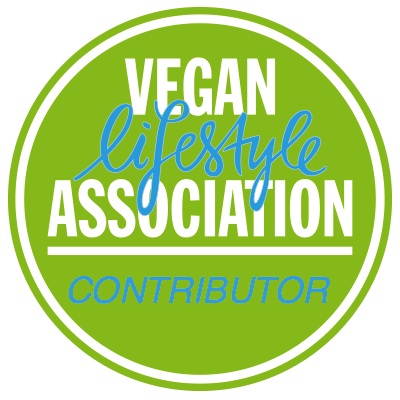 I can't believe over two months has passed since I last wrote and published a post, how time flies! 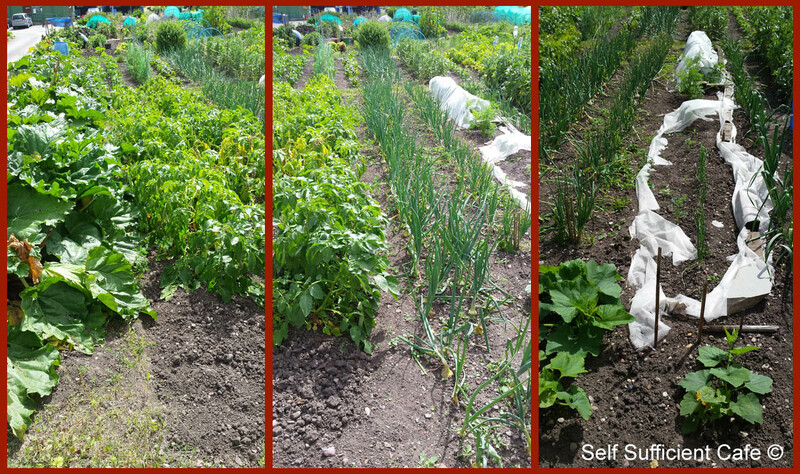 I've been spending a lot of time down my allotment, which needed a hell of a lot of work doing to it. 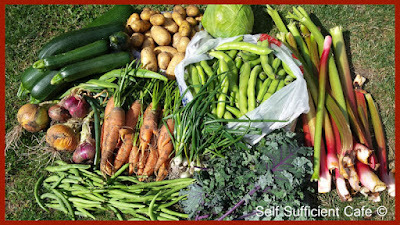 All my hard work has paid off though and I've been busy harvesting and preserving my produce. Thank golly I have a chest freezer now! I love spending time working on my allotment and its where you'll usually find me every weekend. Its like an oasis of calm especially after a mad week at work. Marco loves it too and is spoilt rotten by everyone down there. There is still much to do and I'll write a post soon with an update and some before and after photos so you can see why I've been busy. I've been experimenting with quinoa recently and I must admit I'm loving it, it really is such a versatile seed. I've been doing a little research too, and I've found out that it is a seed rather than a grain as I first thought and it is the seed of the goosefoot plant. It is reported to have a number of health benefits too including anti-inflammatory properties. Quinoa is also a complete protein source containing all essential amino acids. This wonder seed is also a good source of folate and zinc. So you can see why I've been experimenting with it? I've used it in savoury dishes and used it instead of rice for chilli's etc, see my Winter Wellness Chilli Goodness Recipe and yes I've even used it in a 'cheese sauce' recipe! 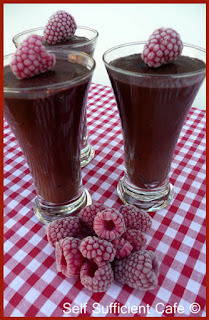 However, I've also attempted to use it in sweet dishes too as in this recipe. The result is good! To jazz it up a little I used a few raspberries from the allotment and the new flavour choc shot which is orange and cardamon. If you've not tried it yet then you should its amazing. First add the quinoa and the boiling water to a saucepan and simmer for 15 minutes.Drain and leave to cool. While the quinoa is cooking add the pitted dates to the almond milk to soak. Once the quinoa has cooled add to your blender along with all the other ingredients. Blend until the mixture is smooth and mousse like. Transfer the mixture to glasses and refrigerate, the mixture will stiffen slightly.